"Quick and easy freezer slow cooker meal." Spread cornstarch into a wide, shallow bowl. Dredge flank steak in the cornstarch to coat completely; put into a large resealable plastic bag. Stir water, soy sauce, brown sugar, carrots, green onions, olive oil, garlic, and ginger together in a bowl; pour into the bag with the beef and seal. 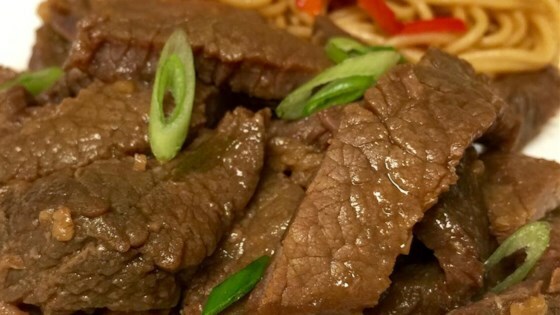 Put bag of marinating beef in the freezer until the day before you wish to prepare it. Remove bag from freezer and put bag into a bowl and place in refrigerator to thaw, at least 24 hours before you wish to prepare the beef. Empty bag into the crock of a slow cooker. Cook on High until the beef is tender, 2 to 3 hours. Alternately, you can cook this on Low for 4 to 5 hours. Prep & stock up for quick weeknight meals! Though this recipe is designed to provide an easy mid-week meal from your freezer, you can also skip the freezer and put it in the slow cooker straightaway. I would definitely put less brown sugar in and out pepper flakes in to spice it up. wonderful with a few changes to taste. Halved the sugar and would probably do less next time and also halved the soy sauce. Increased water to make up the difference. OMG good!